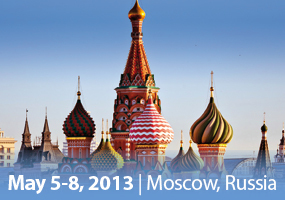 ASMC’13 Moscow is being organized by the European Federation for Medicinal Chemistry (EFMC) and ChemBridge Corporation, as part of the series of events which started with ASMC’04 Moscow, followed by two editions in St. Petersburg (ASMC’07, ASMC’11) and one in Kiev (ASMC’09). This new edition will be chaired by Prof. Peter Seeberger (Max Planck Institute of Colloids and Interfaces, DE) and Dr Alan Palkowitz (Eli Lilly & Company, USA). Beyond key lectures in synthetic and catalytic chemistry, as well as recent case studies in medicinal chemistry and drug discovery, the symposium aims at extending the range from ‘small molecules’ to ‘large molecules’ including carbohydrates, natural products, novel protein scaffolds, dendrimers, and genes; it is expected to attract experts in synthetic chemistry, medicinal chemistry, flow chemistry, total synthesis, catalysis, drug discovery, molecular imaging, and chemical development. and will be completed by a commercial exhibition as well as by an attractive cultural and sightseeing program around Moscow.